Conflicting Viewpoints: what is truth? One of the dilemmas that Lena faces in Empire’s Hostage is seeing history from two sides, and attempting to sort out which version – or which elements of the conflicting versions – is true. In her sojourn north of the Wall, she will be presented with quite a different history than the one introduced to her by Colm in Empire’s Daughter. I am doing my best to remember the emotions generated when I first realized that two different peoples could see history in very different ways. This occured when I read Zane Grey’s depiction of the historical character Simon Girty as a physically unattractive, filthy, greasy-haired ‘Indian Lover’, a traitor to his race and country, which stood in direct contrast to how I had learned about him: as a United Empire Loyalist, compatriot of Alexander McKee, friend of Tecumseh and key player in the British victory in the War of 1812. A hero, not a traitor. There is (was?) 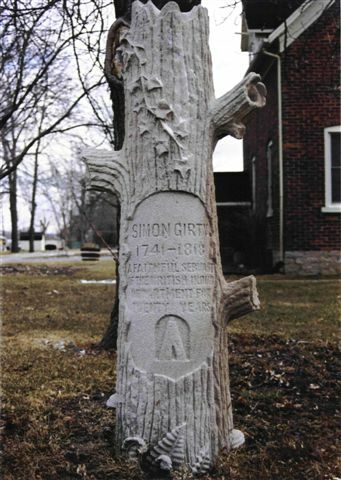 even a memorial stone to him in Amherstburg. I remember being confused by this, and angry, and those emotions giving way to understanding that history was written from the point of view of the beholder, and that there was not one truth. I was a bit younger than Lena is when she confronts this, but I believe that she will react in much the same way – especially since she revered Colm, whose history is under question. But she is also learning to respect her new teachers, so there is significant conflict generated – and it is in considering conflicting viewpoints and reactions that all of us – not just Lena – learn.